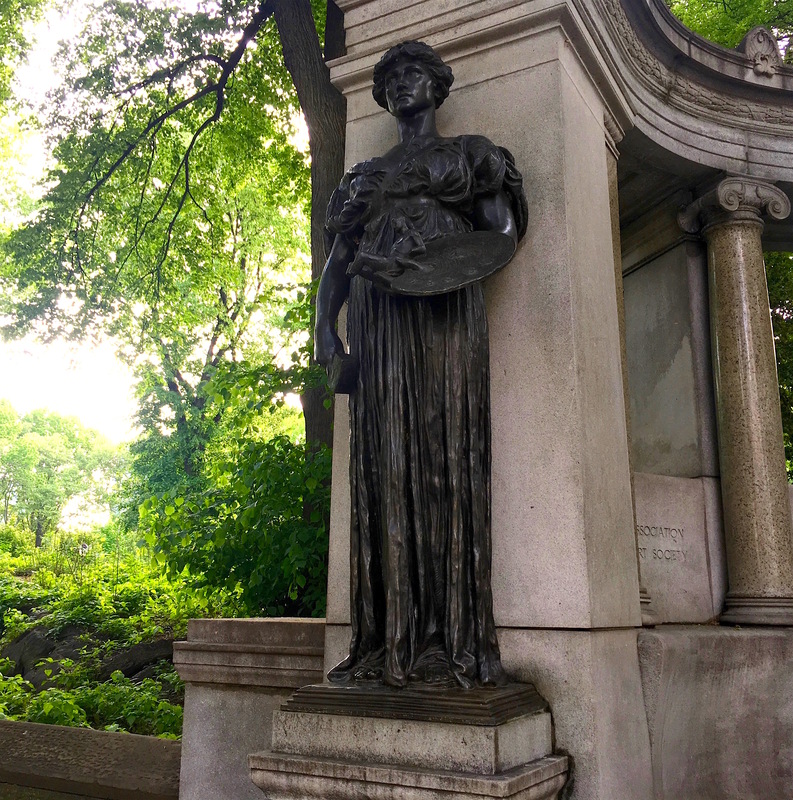 The curved monument to American-born architect Richard Morris Hunt sits weathered and leaf-covered at Fifth Avenue and 70th Street. 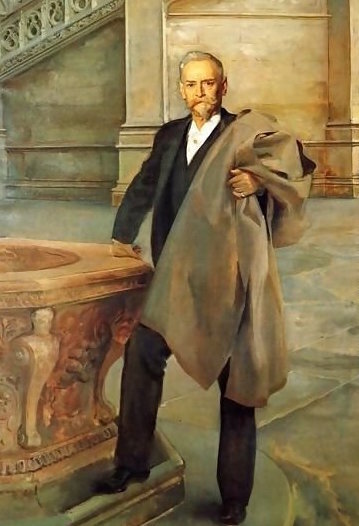 Though not a household name these days, Hunt (below right, in a portrait by John Singer Sargent) was the man who sculpted the look of the Gilded Age. A brilliant visionary with a reputation for humility and humor, Hunt was the starchitect for high society yet also the genius behind public institutions and what’s regarded as the city’s first apartment house. The memorial site is a fitting location; within the surrounding blocks once stood some of the spectacular buildings he designed. Across Fifth Avenue was the Lenox Library, a private precursor to the public library system developed after the turn of the century. 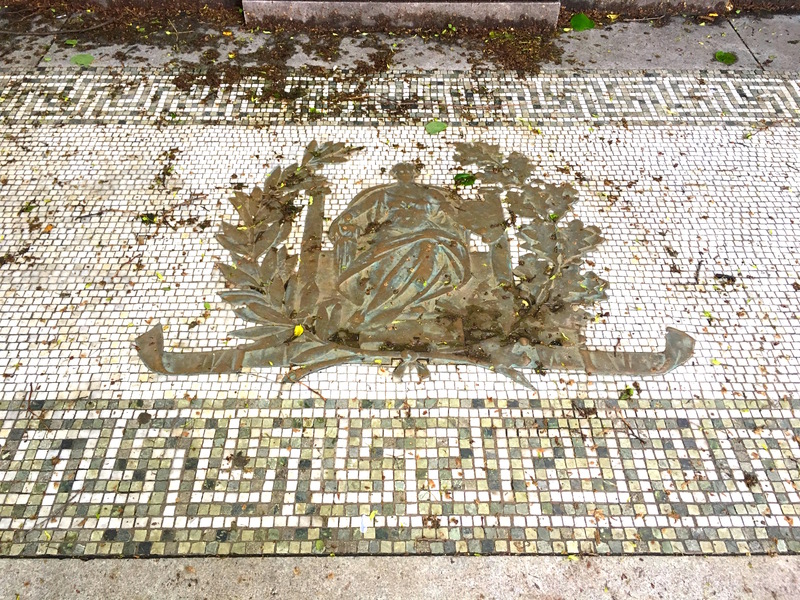 At Fifth Avenue and 65th Street, Hunt designed the mansion for Mrs. Caroline Astor and her son. Astor left her previous, less showy mansion at 33rd Street in the 1890s, after her nephew decided to demolish his neighboring mansion and build the Hotel Waldorf. Hunt was commissioned to build a double mansion, where Mrs. Astor and her son’s family could live in the French Renaissance splendor fashionable among the city’s wealthiest at the time. Hunt also designed “Petit Chateau” for W.K. Vanderbilt and his social-climbing wife, Alva, in 1883 at Fifth Avenue and 52nd Street. The facade of the Metropolitan Museum of Art was another Hunt creation. 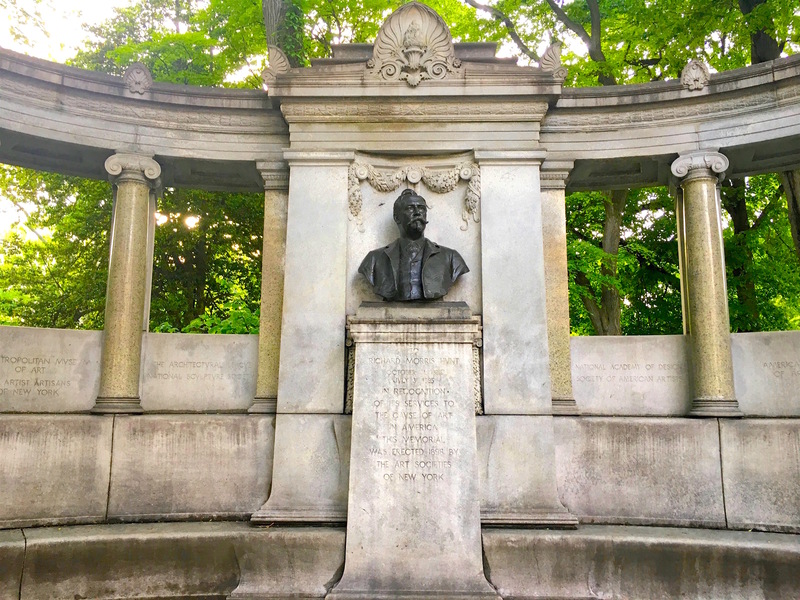 After his death in 1895, plans for a memorial to the man who designed the Gilded Age were drawn. 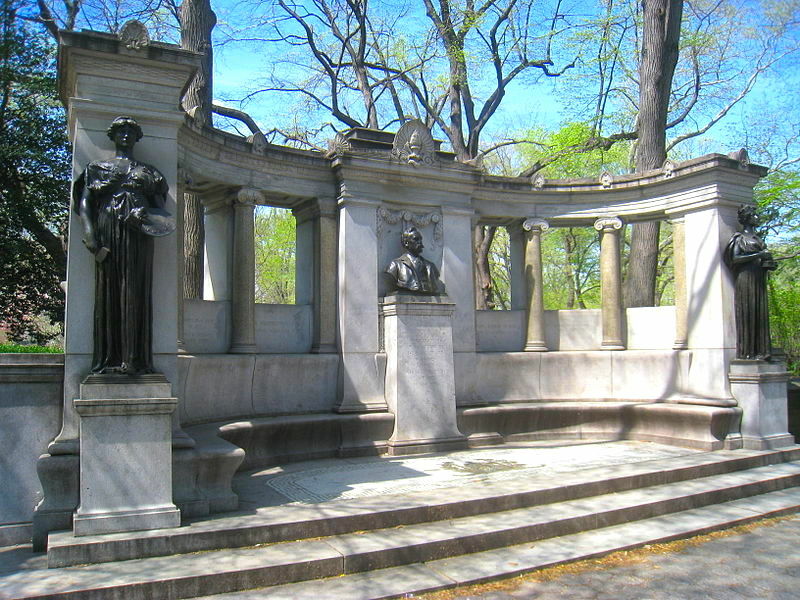 Daniel Chester French (he did the Lincoln Memorial in D.C.) created Hunt’s monument. “At each end stands a female figure, allegorical statues of Architecture, and Painting, and Sculpture,” explains the site. It’s a perfectly Gilded Age-esque monument to the man who had much influence over the way the era looked—quite elaborate and fanciful compared to our pared-down, minimalist tastes today. 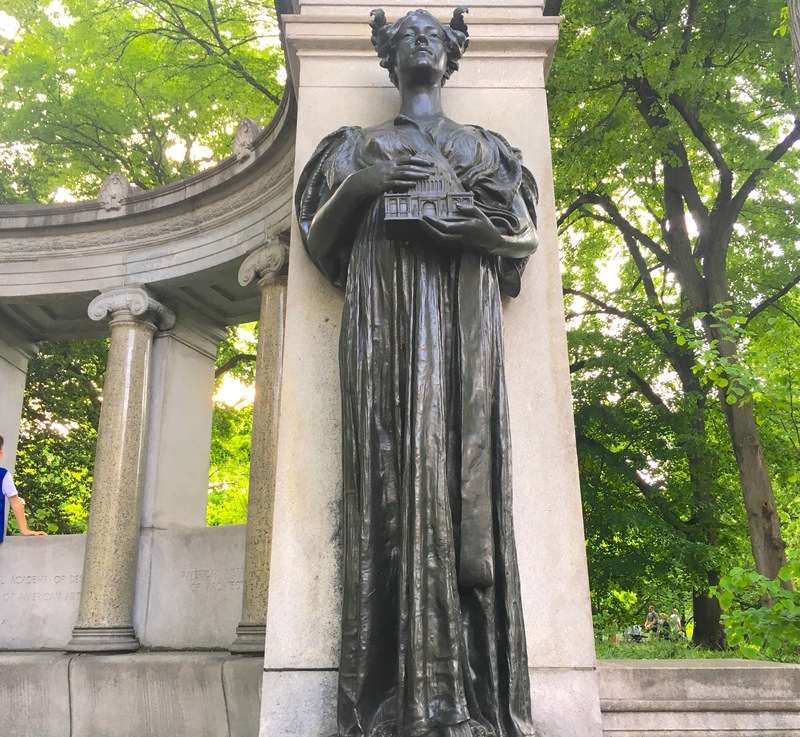 This entry was posted on May 28, 2018 at 4:18 am and is filed under art, central park, Midtown, Music, art, theater. You can follow any responses to this entry through the RSS 2.0 feed. You can leave a response, or trackback from your own site. “starchitect”, no more of this please! I always wondered who this memorial was honoring. Thanks for the answer. ENY is the best! Great article, great memorial, he should be better remembered. If my history of architecture is correct: Hunt was the first American to attend the Ecole des Beaux Arts in Paris. He went on to mentor HH Richardson, who went on to mentor Louis Sullivan, who went on to mentor….Frank Lloyd Wright. And there you have the American progression from Beaux Arts/neo-classicism to modern architecture in 4 steps. And it all started with Richard Morris Hunt.